Sometimes major decisions in one’s life and career are taken when confronted with adversity. This happened to a young Nigerian lady doctor. When Dr Ola Orekunrin’s sister fell ill – very ill, while staying with relatives on a holiday in Nigeria, a local hospital could not attend to her sickle cell anemia. As a result, Ola and her family began to search for an air ambulance to safely take the sister to a suitable medical facility in the country. Their search took them to Nigeria, Ghana, Sierra Leone and Cameroon and across West Africa – but all in vain. The only one to be found was 5 hours away, in South Africa. But by the time transport was arranged, Ola’s sister had died. What’s so sad is that although her condition could have been cured with right medicines in the emergency ward of a hospital, it was not accessible in the time of dire need. It broke Ola’s heart; she quit her job at Jikie Hospital and moved to Nigeria where she could make a difference to the lives of people and improve the country’s healthcare. 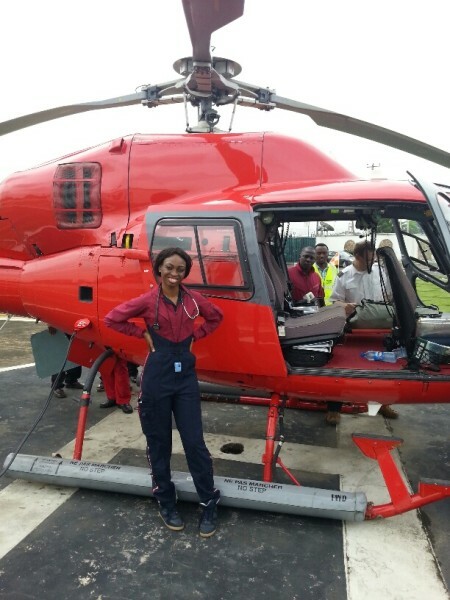 Ola began to study evacuation models and air ambulance services in developing countries so that she could launch her own ambitious enterprise – Flying Doctor Nigeria Ltd. Today, it enables her to combine her love for medicine and Africa with her growing passion for flying a plane. She is also a trainee helicopter pilot. Her motivation to start the caring business was to help critically ill patients get the righty doctor and effective treatment. Today, Flying Doctor Nigeria is the first air ambulance service in West Africa which provides with urgent helicopter, airplane ambulance and evacuation service to seriously injured people. However, Dr Ola’s gritty determination paid off, and today her company is well-established and respected, and has won admiration of the business world and medical profession. She now has a mixed pool of over 20 aircraft use for different types of evacuations, and about 30 staff members in various capacities and branches in Nigeria’s three major cities. Since the launch of the enterprise, hundreds of lives have been saved – not just in Nigeria, but all across the continent of Africa! To this day, the Lagos-based company has airlifted almost 500 patients, using a fleet of planes and helicopters to swiftly shift injured workers and critically ill patients from remote regions to hospitals. From patients with road traffic trauma to bomb blast injuries to gunshot wounds, Ola and her staff are saving lives by providing with high level care en route. Needless to say, honors and accolades have been flooding in. The prestigious World Economic Forum has named Dr Ola among Young Global Leaders Class of 2013, a group it describes as the best of today’s young leaders under 40 years of age. Dr Ola’s journey is truly remarkable. She was born in London, and grew up in foster home with her sister in a seaside town of Lowestoft in England. With a passion for medicine, she studied at the University of York, and graduated as a qualified doctor at just 21 years of age! Her rapid rise in medical field took her to Japan where she was awarded MEXT, the Japanese Government’s scholarship. There she conducted clinic research in regenerative medicine at Jikie University Hospital. In retrospect, Dr Ola started her business in a small way, on a wing and a prayer, and overcame great stumbling blocks. Today, her endeavor is benefitting and blessing hundreds of lives of needy people of this wonderful Continent. For Dr Ola, this is just the beginning of a healthcare revolution across West Africa!